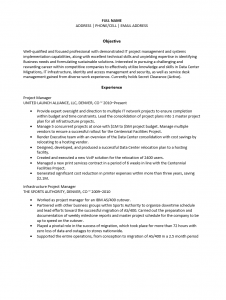 The Infrastructure Project Manager Resume Template gives job seekers a fine opportunity to reach a substantial amount of employers with personalized resumes. This can be particularly useful when wishing to gain an interview for a much sought after job opening. Mostly, potential employers will notice the first inquiries received because those are the ones that will set the bar both in expediency and in quality. If a job seeker wishes to set the bar high, having a top quality resume arrive early in the recruiter’s search process is likely to gain some attention. 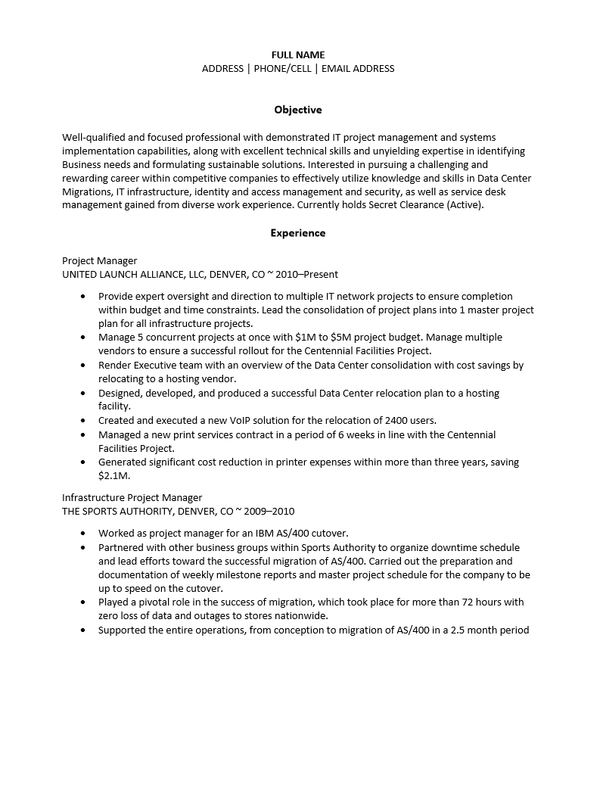 So long as candidates invest some time and energy when initially filling out the Infrastructure Project Manager Resume Template. Step 1. The top of the page is reserved for the applicant’s contact information. This should be your full name, address, phone number, and email address. Depending on one’s tastes this may be centered, aligned to the left, or aligned to the right. It is very important to make sure this section matches the overall ‘feel’ of the resume. Step 2. The Experience section of a resume will give the specifics of one’s employment history. This should include the job tile, company name, location and dates employed. In addition, one should include a list of responsibilities and achievements. Step 3. The Education section is reserved for one to display his or her academic credentials. In this section the user will need to input the degree they earned, where they earned it, and the year of graduation. If the applicant has a respectable score this may be listed. Step 4. The Affiliations section will give an opportunity for the applicant to list what they belong to and may be excellent topic of conversation during an interview. Step 5. The Skills section gives the job seeker and opportunity to list relevant additional information such as certifications earned. Step 6. If one has references, it is usually a good idea to let the reviewer know this. The final section is the References section. One may place their reference information (although he/she should double check with their references before including such personal information) otherwise a simple statement confirming that one has references available is standard.